…and second of the year. My, how I’ve neglected this blog. Today was relatively warm and sunny, so I took the opportunity to root-prune some of the bonsai. March is generally a good month for the job, at least for deciduous species, because the trees are still dormant and are much less traumatised by the experience than if they were in growth. This year the ash trees (Fraxinus spp. ; never got around to trying to determine the exact species) were troublesome. For whatver reason they were both really potbound, with long roots wrapping all around the pots, plus a nearly solid mass of fibrous roots. Ideally one wants to encourage a fibrous root system in bonsai, but these were really overcrowded. In one case it was somewhat understandable because the pot was too small for how large I let the tree get. I have trouble finding bonsai pots that I like that I don’t have to remortgage my house to afford, but I did manage to find one several months ago, so it’s in a bigger pot now. I’m wondering if I overfertilised or underwatered them last year. Or maybe I did a half-assed job with last year’s root pruning. Or maybe it’s just one of those things, I dunno. I didn’t manage to do all I wanted before the light faded, because I’ve got a couple of wild cherry saplings that I’m thinking of turning into bonsai. I can’t remember which is a wild black cherry (Prunus serotina), and which is a chokecherry (Prunus virginiana). I ID’d them last year but never got around to marking them so I could tell the difference without leaves. I’m not sure how good a bonsai they’ll make. They’re naturally small trees that prune well, so in that sense it should be easy – but they have extremely vigorous root systems and in fact at two or three years old (last year) and in one-gallon pots, they were already suckering. Possible candidates for a grove-type massed planting, which I’ve never tried. We’ll see, but that’s a job for another day. Also began indoor vegetable seed starting early this month. This year is going to be quite an…experience…in the vegetable garden, because not only am I trying some new stuff, they’re forecasting an even drier-than-usual summer this year. Yay. I went to Florida in February and bought a few things off the seed rack, plus I got a couple things at Mississauga Seedy Saturday. I’m trying a blue sweetcorn (and already wondering how to keep the squirrels off them), romanesco (a brassica that’s sort of like a cross between broccoli and cauliflower and looks like a green fractal conch shell), and artichokes (which may well turn out not to be hardy around here, but here goes). And this is all in addition to the usual carrots, cucumbers, tomatoes, onions, garlic, cabbages, radishes, lettuce, and peas. Sucker for punishment, me. If not for succession planting and container gardening I’d need to rent space from the neighbours. Speaking of seeds, there’s been one disappointment. My Master Gardener group did a children’s garden at a local home show event in mid-February and for one of the activities I removed about seventy plantlets (I hate calling them pups) from my giant spider plant (Chlorophytum comosum) planter to root up. To my surprise I also found seed pods, so I sowed a few seeds. They sprouted, but unfortunately none of the seedlings produced chlorophyll and stayed white. No pigmentation, no food; no food, seedlings die. Sigh. The wonders of genetics. And finally, the calla lilies (Zantedeschia ‘Schwartzwalder’) and dahlia (Dahlia ‘Karma Chocolate’) that were overwintering in the basement have sprouted, so they came up into the light. The tulips outside began sprouting early this month – this past winter was rather odd, being generally mild with occasional harsh spells. This spring has also been up and down so far. Hurrah for pointless rambling posts. I haven’t done much in the garden for the past few days, but there isn’t really much to do now. There are a few things to clip down and compost, but even those can wait until spring, and I won’t mound and burlap the roses until probably the middle of November. I did make a start of harvesting the Jerusalem artichokes, a.k.a. fartichokes (Helianthus tuberosus). And by that I mean that I dug up the one that I planted out of place last year, though gods know why I did that. It also meant that with it gone, I could finally plant the poor suffering raspberry plant (Rubus sp.) a fellow Master Gardener gave me in May. This is a slight departure from my usual gardening M.O. because I very seldom put anything in my garden unless I know exactly what it is. She’s had that raspberry variety for a long time now and no longer remembers the name (so I can’t look it up), but I’ve seen it growing and tasted the fruit and I’m satisfied to have it. So I planted it in the space left by the fartichoke. That unfortunately was all I had time for today before it got dark, so I’ll have to deal with the remaining Jerusalem artichokes later in the week. 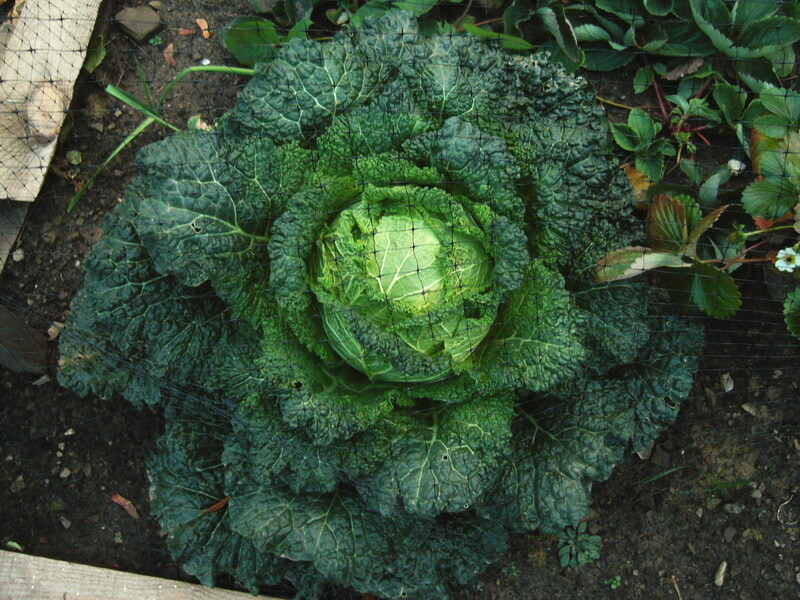 Another thing I’ll harvest soon is the remaining ‘Melissa’ Savoy cabbage. I started three plants this year, but one of the seedlings didn’t make it. Of the other two, one took longer to really get going than the other, so they naturally staggered their harvesting times, which was ideal. The first one got picked nearly a month ago. This second one has been the subject of some attention when people visit the garden; for some reason they think it needed photographing. I’m not sure why; to me it looks pretty much how a cabbage ought to look and the first one looked the same…but I did take a picture. Apologies for the bird netting; I thought if I planted them at the edge of the strawberry patch, the netting would keep the accursed Cabbage White butterflies (Pieris rapae) off them. It didn’t. I used a lot of good words the first day I saw the butterflies just sailing right on through. Anyway, soon cabbage will be on the table again. I like Savoy better than plain old white cabbage, and anyway I don’t see the point in growing the same things as in the supermarket, which are sadly increasingly becoming GM varieties. Roses and death and fruit. The rose page is complete now; I’ve added pictures and descriptions of all the roses I have. …actually, not all. A couple years back a wild rose popped up under a juniper bush and I dug it up and put it in a pot. It hasn’t bloomed yet so I’m not sure what species it is, or if I’ll keep it when I figure it out. Aside from that, the summer blooms are still in full swing, and the vegetables are doing okay. I’m so eager to try out some homemade insecticide. Last year I sowed some pyrethrum daisies (Tanacetum cinerariifolium) and now the flowers are cut and dried. I’m looking forward to spraying the cabbages because the pyrethrum won’t kill anything beneficial on those. A pity I can’t spray the roses, but the bees do visit them. Perhaps I could try it on the water lilies to control the leaf-mining midges. I never did get fish, so saturating the tub ponds with pyrethrum should be an interesting experiment. I think I will have to replace the strawberry plants though. A fellow Master Gardener gave me them last year because I was tired of the variety I had before and wanted to try a different kind. Unfortunately, these ones seem to be the wild strawberries…the fruit are about the same size as my fingernail and I just can’t be bothered. In fact, there are wild strawberries growing all over the place in the rest of the garden, so I’m certainly not going to cultivate more. Things should be going on sale soon at the garden centres, so with any luck I’ll be able to find something to try. I do have a couple of wild black raspberry bushes (Rubus occidentalis) though, and those are cropping like mad right now. I know it sounds crazy, but the taste of the fruit (or possibly the seeds; they’ve got lots of seeds) always reminds me of mayonnaise. Oh, and one batch of elderflower wine is on the go. I’ll probably start another batch in a couple days. I’ve had some computer trouble the past couple of weeks, but here I am again. Although I don’t know why. It’s been a busy three weeks in the garden, so this will be a long post. The single most apparent thing is that I extended the flowerbed at the front, saying goodbye to more of the hated lawn. So far I’ve planted the American hazel (Corylus americana) and the trumpet creeper (Campsis radicans). The trumpet creeper will be an interesting experiment, because it’s quite a vigorous growing vine. I recycled a trunk of the lilac shrub at the back as a post for the trumpet creeper to grow up, and then I’m going to try and see if I can get it grow into something resembling a standard. (In gardening talk, a ‘standard’ is a style of shrub or small tree, trained to grow with a single upright slender trunk and a more-or-less spherical mass of foliage and flowers at the top. Think of the lollipop looking trees that a four-year-old might draw.) There are a few more things waiting to be planted there, but I’ll talk about those when I’ve actually done so. I also planted (most of) my tomato plants today: one dozen ‘San Marzano’ tomatoes. The radishes are coming along, as are the peas, but the cabbage seedlings are scrawny. In the herb beds, there are now peppermint, chocolate peppermint, lemon balm, stevia (as an experiment) and catnip. These are all either replacements for things that died in that last harsh winter, or completely new. Heliotrope ‘Poseidon Blue’ and pansy ‘Black moon’ are in planters, and my seeds for nicotiana ‘Chocolate Smoke’ and poppy ‘Black Peony’ are waiting to be sown. I know none of those is native, but I’m a total sucker for very dark-coloured flowers, so I justify it by growing them in planters (and most of those are annuals anyway). At the back is now planted a western blue clematis (Clematis occidentalis), which is one of only two species of clematis native to this region (the other one, Clematis virginiana, is rather boring-looking in my opinion). And I finally got my tub garden going! I now have two fragrant white waterlilies (Nymphaea odorata) and a marsh marigold (Caltha palustris) in tubs of water. The original plan was to beg, borrow, or steal some floating bladderwort (Utricularia sp.) to keep the mosquitoes down – bladdwort is a carnivorous aquatic plant – but I don’t know if/when that will happen, so I might be making the trip to the petshop for a couple of fish soon. Again, I have a few more things to plant that I’ll mention when they actually get in the ground. Another ash (Fraxinus sp.) sapling has been turned into a bonsai. It’s pretty much the very end of the window for the necessary severe root-pruning, so I’m not sure if it will pull through. And jewelweed (Impatiens capensis)! I finally have jewelweed! Sowed some cabbages outdoors, set the last of those black violet seeds, and started hardening off the peas. A few of those saplings are two years old now, so now it’s time to start training them into bonsai in earnest. The liverwort is blooming. And man, those damned tomato seeds took forever to sprout. I guess the seed-house didn’t ferment them first. I can’t imagine why people seem to have trouble getting their tulips to regrow or spread. I can’t get the flippin’ things to STOP spreading. You know, I can’t help laughing whenever I go to the garden centres and see there’s a climbing rose cultivar called ‘Golden Showers’. It has yellow flowers, of course.